Dreamcatchers have long passed their symbolic meaning and traditional design. These decorative items now come in all shapes and sizes. Some even wear earrings with dreamcatcher patterns, while others use the catchers to decorate their gardens. 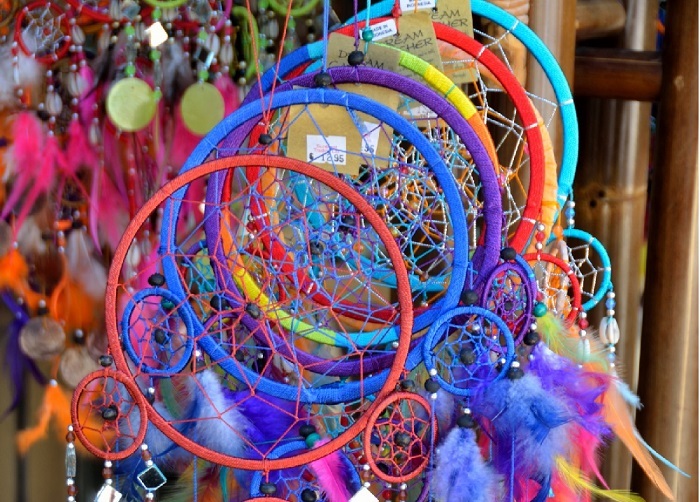 Traditional dreamcatchers use the same pattern and have a circle design, with hanging feathers. These come from the Indian tradition which claimed that good dreams fall like feathers. Meanwhile, nightmares get caught in the pattern and remain there until they vanish. Indians from the Ojibwa culture used to hang them above baby cradles. As the culture spread among Americans, so did the dreamcatchers. Later, they became decorative elements with hundreds of designs. You can recognize them by the spiderweb pattern, wooden hoops and leather elements. Modern dreamcatchers can be square, star-shaped, moon-shaped and even have minimalistic patterns. They feature neon colored or romantic styles, glamour gem stones, bohemian horizontal hoops or shaped patterns. 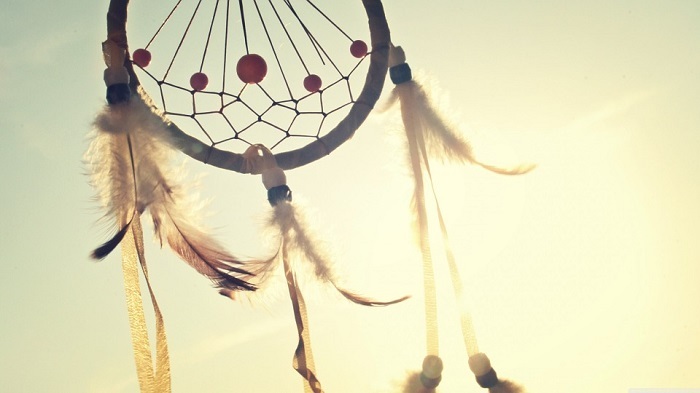 Here are the best dreamcatcher designs that catch your eye and get into your heart! We begin our journey with a traditional design with a modern sparkle. Dreamcatchers with teardrop hoops can easily be personalized by hanging more feathers of similar colors. Some models also include gem stones and beads. Dreamcatchers with teardrop hoops carry the symbolic Indian tradition, while enforcing modernity with monochromatic looks or similar tones. You can paint stars or hearts on feathers or keep their natural look by enhancing their stripes. Dreamcatchers with extremely vibrant colors can decorate any room, regardless of your decorative tone choices. Intense tones such as red, orange, yellow, green, blue and purple can go with matching multi-colored feathers. Such dreamcatchers make a strong decorative statement and are usually a bit large-sized. They also come with three small hanging hoops in the same colors. Hoops can take different shapes in modern dreamcatcher art. If they can hold a pattern, they’re good for use. Therefore, imagine a dreamcatcher that has two circle hoops next to each other. Then, imagine that each pattern has a differently colored gem in its center. 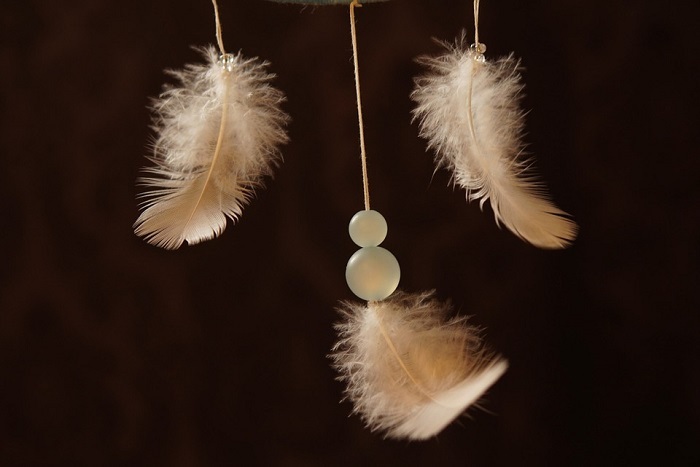 By placing two feathers above the hoop, you have a night owl in your dreamcatcher. Such catchers usually look good with many hanging feathers in similar pastel colors, to create a continuous effect. The owl dreamcatcher also symbolizes wisdom and looks good in any bedroom style. 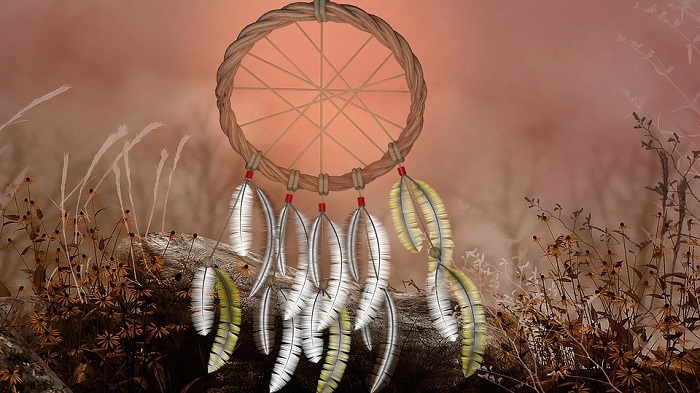 How about a dreamcatcher with a tree-design pattern and glow-in-the-dark feathers? This bold design brings luminosity into your bedroom. During the day, your dreamcatcher will be white. At night, it features a subtle neon green glow. You can create such a dreamcatcher by purchasing glow-in-the dark feathers and adjust the pattern to tree design. This process is not complicated and is stylish due to vintage feathers and modern night light. Boho dreamcatchers can complete a room decoration in any color. This creative dreamcatcher allows you to hang crystal beads instead of feathers, for an aspect that stands out. You can insert artwork instead of spiderweb hoop pattern and magnify the drama effect. Even if the result is a modern style dreamcatcher, the object still carries its meaning. According to a scientific research, we can decode our dreams and interpret the narratives in four ways. So, why not influence them while we look at a modern and exquisite dreamcatcher? A good schedule sleep is key to learning more and better from every day. Although the dreamcatchers’ effect has not been scientifically proven, you can use them to decorate your home or even garden in a modern and stylish way. The above 5 designs are some of the best that readers and amateurs search for and create. 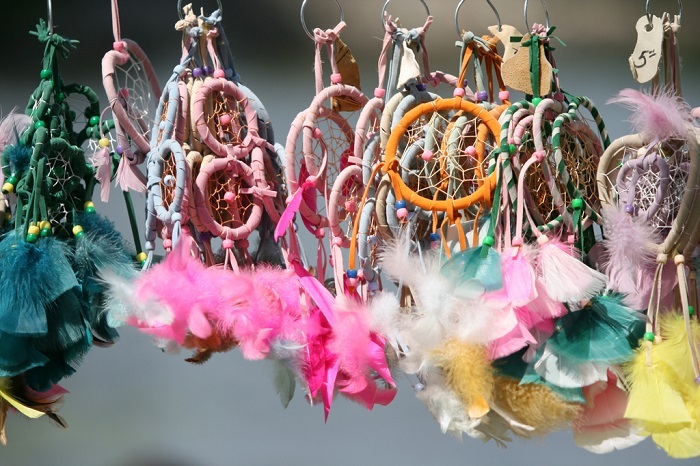 Find your style and create your next dreamcatcher! Images: 1, 2, 3, 4, 5.